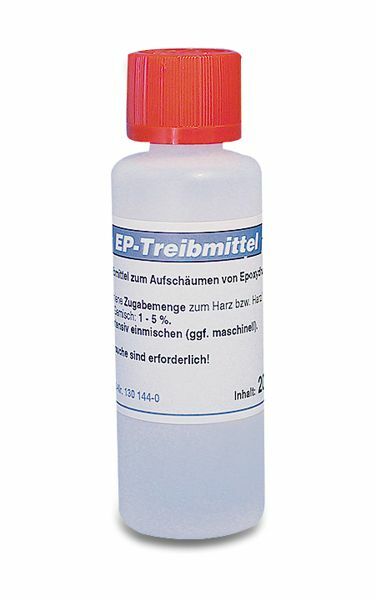 Foaming agent for epoxy resins (200 gr). The foaming agent is insoluble in the resin constituent, so it must be carefully dispersed. The foaming agent must be added with the corresponding mixing machine, mixing by hand is generally inadequate. The quality of the epoxy resin foam very greatly depends on the quality of the resin-agent dispersion: the finer the distribution, the more uniform the foam structure. Recommended quantity added to the resin or resin and hardener mixture: 0.5–2.0 %. The crucial factors affecting the density are many, so preliminary tests are indispensable for determining the optimal foaming agent content. For larger batches (> 100 g), the exothermic reaction of the resin system used should be considered. We therefore recommend to use resin systems with potlifes > 60 minutes. An additional amount of thixotropic agent will enhance the expansion characteristics.